Open to Door Cars ONLY! -Any engine combo or power adder permitted! -Any rear suspension and any rear tire size permitted! -Clocks off, 1/8th mile, pro .400 tree. Names will be drawn at random (No Qualifying! ), racers get 2 test passes each before eliminations begin. -Must be an Import or Domestic DOOR CAR. Any year vehicle is allowed. Lightweight components are limited to hood, doors, front fenders, roof, decklid, hatches, sunroofs, wings, ground effects, and bumpers only. Quarter panels must remain steel. One-piece front ends are not permitted. FWD cars are permitted to run widened three-piece front ends. No body parts may be removed during competition. -RWD cars must utilize stock front and rear suspension and mounts. FWD & AWD cars must utilize stock front suspension and mounts. Aftermarket front control arms, rear control arms, and sub-frame connectors are permitted. Aftermarket struts and shocks are permitted. Ladder bars and traction bars are permitted. Aftermarket four links and wheelie bars are PROHIBITED on all cars. -OEM glass or lexan windows are permitted. -Aftermarket factory appearing dashboard and full interior from front seats forward is required (passenger seat may be removed). Aftermarket seats, gauges, and interior are permitted. -Manual or Auto transmissions are permitted. Any style automatic transmission is permitted. Trans-brakes are permitted. Manual transmissions are permitted to use aftermarket stock-style clutch-assisted transmissions. Sequential transmissions are permitted on rotary cars and 4-cylinder cars only. Aftermarket bell housings are permitted. NO AIR SHIFTERS ALLOWED! -Tire size rulings as follows…NO TREADED STREET TIRES ALLOWED! -Races will be ran on a pro .400 tree, full 1/4 mile, clocks off basis. Each racer gets two test runs before eliminations begin. -Stock mass production small blocks only- no aftermarket blocks allowed (i.e. Ford Motorsports, Bowtie, Dart, World, Mopar Performance, etc. ), but internals may be of any aftermarket variation. Any blocks with numbers missing or ground off will be denied entry to participate, and lock in money will be kept for the pot! Racers must be prepared to show where factory castings on their blocks are. 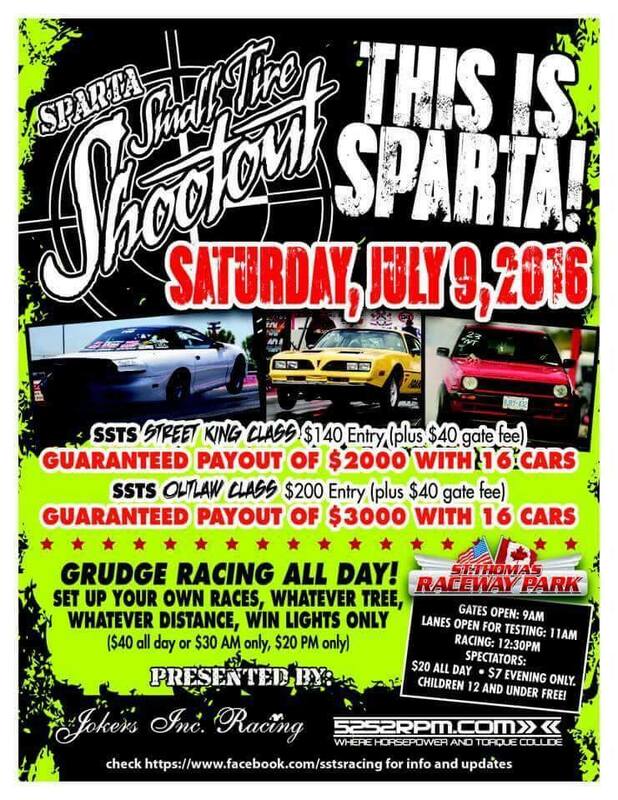 -Heads up, 1/8th mile, pro .400 tree, run order drawn at random (no qualifying), Each racer gets one test run, clocks off! 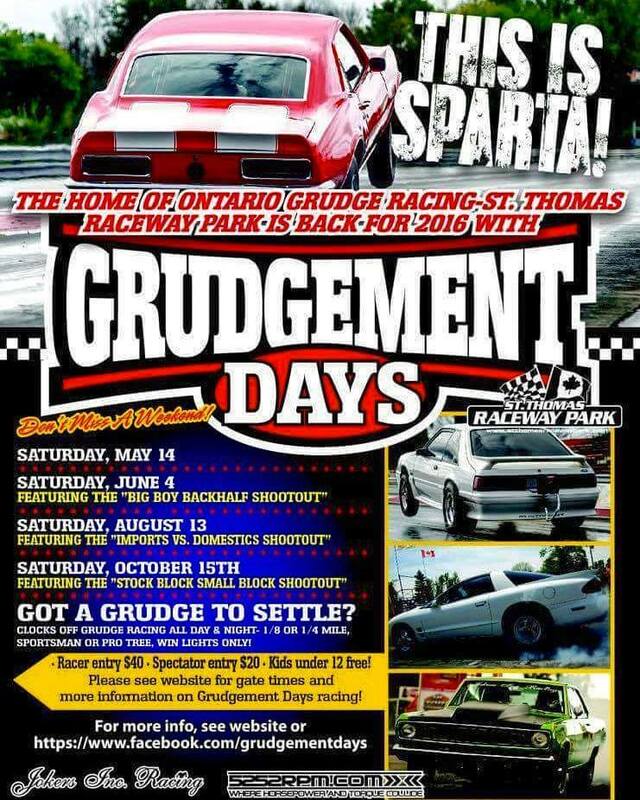 To lock in or any questions about rules please email jokersincracing@gmail.com or contact Matthew SSTS on facebook!